The Cincinnati Bengals gathered for the first time under Taylor on Tuesday, the start of voluntary offseason workouts. They got a feel for how the new coach will operate, received new playbooks, and officially started a different phase in franchise history. "Like the first day of school, man," receiver A.J. Green said. 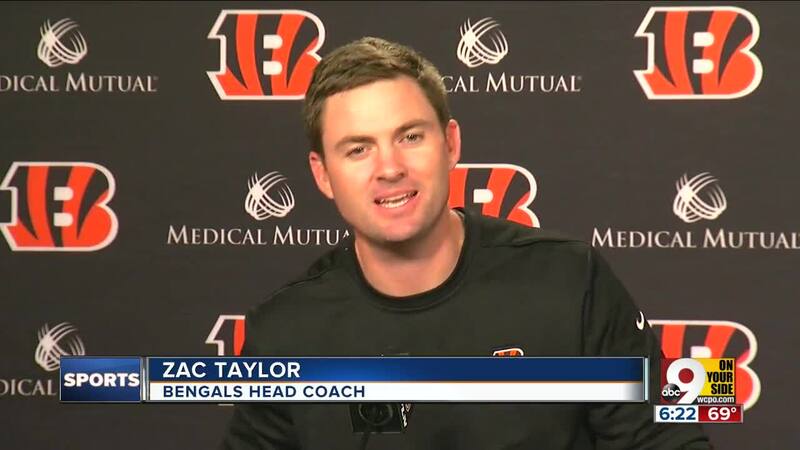 CINCINNATI — Zac Taylor got up early Tuesday and headed to Paul Brown Stadium for his first meeting with his new team, one that was watching closely to see how the 35-year-old coach would handle himself. "To be only a couple years younger than a lot of these guys — it's different," said Dalton, 31. "Our kids are all the same age. It's different, but I think it's also fun."